Ideally, when we concentrate, blood flow should increase in the brain, especially in the prefrontal cortex; this increased activity allows us to focus, stay on task and think ahead. In the brains of most people with ADD, blood flow actually goes down when they concentrate, making it harder to stay focused. In other words, the harder they try, the harder it gets! ADD, like many other conditions, is not just a single and simple disorder; therefore, treatment is not a one-size-fits-all solution. We have identified 7 types of ADD—and each requires a different treatment plan because of the diverse brain systems involved. This first type of ADD is usually evident early in life. As babies, they tend to be colicky, active and wiggly. As children, they tend to be restless, noisy, talkative, impulsive and demanding. Their hyperactivity and conflict-driven behavior gets everyone’s attention early on.Classic ADD is often called ADHD, with an emphasis on the hyperactive behavior trait. At the Amen Clinics, we do not use the term ADHD exclusively because not all of the ADD types are hyperactive. Parents of these kids are often tired, overwhelmed and even embarrassed by the behavior of their non-stop and hard-to-control children. Classic ADD tends to be more frequently seen in boys. Classic ADD SPECT scan findings show normal activity at rest, but during concentration there tends to be decreased activity in the underside of the prefrontal cortex, cerebellum and basal ganglia. The basal ganglia are structures deep within the brain that produce the neurotransmitter dopamine; critical to motivation, attention and setting the body’s idle speed. Inattentive ADD is the second most common type of ADD. Those suffering with this type are usually quiet, more introverted and appear to daydream a lot. They may be labeled as unmotivated—even slow or lazy. Inattentive ADD is common but is often missed because children with this type tend to have fewer behavioral problems. They don’t draw the negative attention to themselves as do those with Classic ADD. Inattentive ADD is the perfect example of why the general term “ADHD” does not fit all ADD types. If clinicians and parents are looking for hyperactivity to reach a diagnosis, those with this type, which is absent of hyperactivity, may be left untreated and go on living life below their true potential. Inattentive ADD SPECT scan findings show normal activity at rest, but during concentration there tends to be decreased activity in the underside of the prefrontal cortex, cerebellum and basal ganglia. In order to focus, it is necessary to continually be able to shift your attention. People suffering with Overfocused ADD have most of the ADD features, but rather than not being able to pay attention, they have difficulty shifting their attention; they become hyper-focused on certain things while tuning everything else out. These folks tend to get stuck or locked into negative thought patterns and behaviors. This type of ADD is often found in substance abusers as well as the children and grandchildren of alcoholics. Overfocused ADD SPECT scan findings show increased activity at rest and during concentration in the anterior cingulate gyrus, as well as decreased activity in the underside of the prefrontal cortex, cerebellum and basal ganglia. People with this type of ADD have the hallmark features of ADD plus symptoms associated with temporal lobe problems, such as issues with learning, memory, mood instability, aggression, temper outbursts, and sometimes, even violence. It is not unusual to see this type of ADD in people who have had head injuries. Temporal Lobe ADD SPECT scan findings show decreased activity (and occasionally increased) activity in the temporal lobes at rest and during concentration, as well as decreased activity in the underside of the prefrontal cortex, cerebellum and basal ganglia during concentration. In Limbic ADD, the prefrontal cortex is underactive during concentration while the deep limbic area—which sets your emotional tone, controlling how happy or sad you are—is overactive.Depression is also associated with overactivity in the deep limbic area, yet a person’s developmental history in addition to some subtle differences on SPECT scans (between Limbic ADD and depression) helps us differentiate between the two conditions so we can choose the best course of treatment to resolve symptoms. Limbic ADD SPECT scan findings typically show increased deep limbic activity at rest and during concentration. There is also decreased activity in the prefrontal cortex, cerebellum and basal ganglia during concentration. 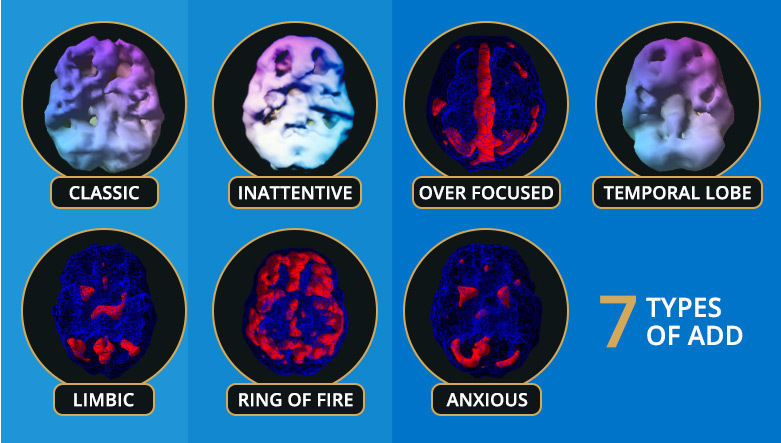 In Ring of Fire ADD, there is a pattern of overall high activity in the brain. Those with this type tend to have difficulty “turning off” their brains and typically feel overwhelmed with thoughts and emotions. This type tends to do much worse on stimulant medications alone.Ring of Fire ADD can be related to some form of allergy, infection or inflammation in the brain, or it can be related to bipolar disorder. There are some subtle differences between Ring of Fire ADD and bipolar disorder in the scan data as well as some differences in the presentation of a person’s symptoms. For instance, we have found that the kids with ADD tend to have their problems all of the time whereas bipolar kids tend to cycle with their mood and behavior problems. Adults with bipolar disorder have episodes of mania while adults with Ring of Fire ADD do not—their behavior issues tend to be consistent over long periods of time. Of note: It is possible to have both conditions—in fact some research studies suggest that as many as 50% of those with bipolar disorder also have ADD. Ring of Fire ADD SPECT scan findings show patchy increased activity in many areas of the brain, which looks like a “ring” of overactivity. We have found that there is some variability in Ring of Fire patterns from individual to individual. In differentiating between bipolar and Ring of Fire ADD, it is important to consider the SPECT scan data in addition to the patient’s clinical history. Anxious ADD SPECT scan findings show increased activity in the basal ganglia at rest and during concentration. Additionally, there is decreased activity in the prefrontal cortex and cerebellum during concentration. Knowing your particular type of ADD is very important. Even though the 7 types have some symptoms in common, each type also has its own set of symptoms and specific treatments. One size does not fit all: What works for one person with ADD may not work for another—or could even make the symptoms worse.